New guidance for psychologists will acknowledge that adolescence now effectively runs up until the age of 25 for the purposes of treating young people. So is this the new cut-off point for adulthood? “The idea that suddenly at 18 you’re an adult just doesn’t quite ring true,” says child psychologist Laverne Antrobus, who works at London’s Tavistock Clinic. Child psychologists are being given a new directive which is that the age range they work with is increasing from 0-18 to 0-25. “We are becoming much more aware and appreciating development beyond [the age of 18] and I think it’s a really good initiative,” says Antrobus, who believes we often rush through childhood, wanting our youngsters to achieve key milestones very quickly. Over the course of adolescence the way in which information is processed is dramatically changing, and what new scanning techniques have shown has enabled us to demonstrate what the neurological changes are. This is particularly important in terms of social reasoning, planning, problem solving and understanding. So the brain is reorganising itself, which then means that different thinking strategies are used as your brain becomes more like an adult brain. The prefrontal cortex is the key area that has the most interesting changes in adolescence, so if you do functional MRI studies with children and adolescents and adults, you see differences in the way that they process information. The new guidance is to help ensure that when young people reach the age of 18 they do not fall through the gaps in the health and education system. The change follows developments in our understanding of emotional maturity, hormonal development and particularly brain activity. “Neuroscience has made these massive advances where we now don’t think that things just stop at a certain age, that actually there’s evidence of brain development well into early twenties and that actually the time at which things stop is much later than we first thought,” says Antrobus. There are three stages of adolescence – early adolescence from 12-14 years, middle adolescence from 15-17 years and late adolescence from 18 years and over. Neuroscience has shown that a young person’s cognitive development continues into this later stage and that their emotional maturity, self-image and judgement will be affected until the prefrontal cortex of the brain has fully developed. Alongside brain development, hormonal activity is also continuing well into the early twenties says Antrobus. “A number of children and young people I encounter between the age of 16 and 18, the flurry of hormonal activity in them is so great that to imagine that’s going to settle down by the time they get to 18 really is a misconception,” says Antrobus. She says that some adolescents may want to stay longer with their families because they need more support during these formative years and that it is important for parents to realise that all young people do not develop at the same pace. But is there any danger we could be breeding a nation of young people reluctant to leave adolescence behind? 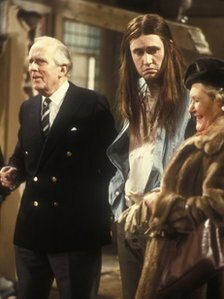 TV sitcoms are littered with such comic stereotypes of juvenile adults, such as Smithy from Gavin and Stacey or Private Pike in Dad’s Army. Then there are those characters who want to break away from their overbearing or protective parents or guardians and reach adulthood, but struggle to cut the family ties. “Often it’s claimed it’s for economic reasons, but actually it’s not really for that,” says Furedi. “There is a loss of the aspiration for independence and striking out on your own. When I went to university it would have been a social death to have been seen with your parents, whereas now it’s the norm. Furedi says that this infantilised culture has intensified a sense of “passive dependence” which can lead to difficulties in conducting mature adult relationships. There’s evidence of this culture even in our viewing preferences. He does not agree that the modern world is far more difficult for young people to navigate. But should parents really be encouraging adolescents to make their own way in the world more? The TV series Girls – with central character Hannah Horvath struggling with adulthood – has captured the zeitgeist. Hannah’s parents have cut her off financially and she has to live away and navigate her 20s making her own mistakes. Should adolescents have to make it on their own like the cast of Girls? One of the traditional rites of passage for adulthood was always leaving home, but TV property expert Sarah Beeny says that adolescents do not have to move out of the parental house in order to learn how to be independent and there are huge advantages to multi-generational living. “The solution to not having useless 25 [and] 30-year-olds living at home is not sending them out of the home, it’s making them do their own washing, pay their own way, pay towards the rent, pay towards the bills, to take responsibility for cleaning up their bedroom and not waiting on them hand and foot,” says Beeny. She says that parents should play a part in teaching adolescents key skills and that young people in return can keep their parents current. The idea of parental responsibility to adolescents should also extend to another external symbol of maturity says motoring expert Quentin Willson – the car. He says it has become a “talisman” for young people to feel more mature. Willson says statistics show that at the age of 18 the vast majority of accidents caused by young drivers are down to bad judgement and decision making, and that behind the wheel “adult maturity isn’t fully formed until you get past 25 for most cases of people”. But rather than raise the minimum age for driving, Willson believes parents and teachers should impart safe driving skills before the effects of adolescence really kick in. “If you teach these children when their mindsets are pure and before they’ve been corrupted by things like Grand Theft Auto 5 and Top Gear and all these corrosive social pressures, then you get the road safety message in much earlier,” says Willson. With such racing hormonal activity and adolescence taking much longer than we previously thought, how will we know when we actually do reach adulthood? For Antrobus it is when independence “feels like something that you both want and can acquire”. But for the eternal adolescents among us, perhaps Beeny’s definition is apt. “For me adulthood is realising that there are no grown-ups and everyone else is winging it,” says Beeny.